Good or bad, they’re everywhere. Introductions of rainbow trout have caused the extinction of many species and are one of the primary reasons that inland sub-species of cutthroat in the western US have declined, or in some cases become entirely extinct. 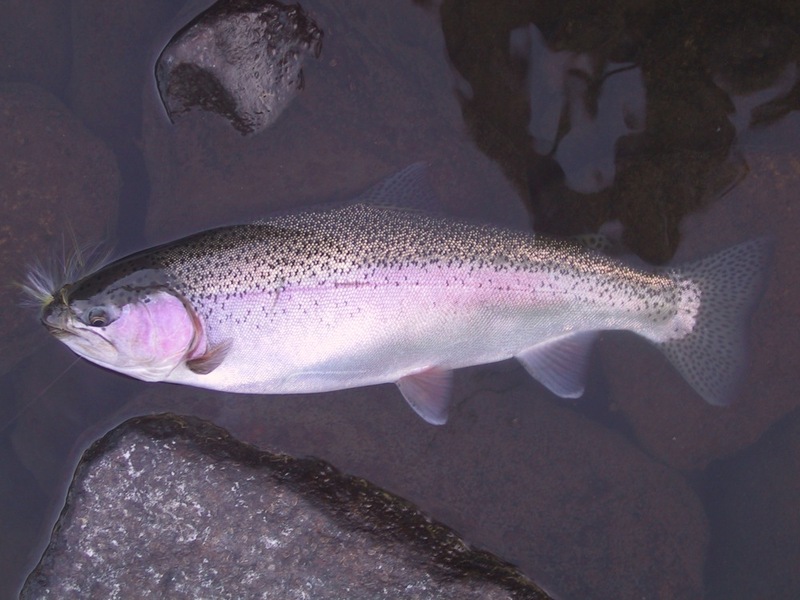 The Yellowfin, Waha Lake, and Alvord cutthroats, of Colarado Idaho, and Oregon respectively, have entirely disappeared due to the introduction of non-native rainbows which have hybridized them out of existence. Some subspecies only occupy tiny portions of their historic range for the same reason. Brook trout in the eastern US are being displaced by rainbows in some places because they can inhabit warmer waters. There are, however, the westslope and coastal cutthroat sub-species which co-exist naturally with rainbows. Rainbows consist of several sup-species and are native to the rivers and lakes which flow into the Pacific Ocean from Russia to Mexico. They also inhabit some inland closed basins in California and Oregon where they became established when a stream or river changed course through a process called headwater transfer or when a river’s flow was insufficient to fill the basin and flow into the neighboring one. In the Snake River of Idaho they are native only to the rivers and lakes downstream of Shoshone Falls near Twin Falls, Idaho. They were introduced to areas above the falls and have subsequently displaced and hybridized with Yellowstone cutthroat. There are also several strains of rainbow trout that have developed throughout their range and different forms within those groups. Some groups have resident forms and anadromous forms which grow in the ocean and they are called steelhead. Sub-speciation occurs more readily with freshwater fish than with animals whose movements aren’t restricted by water. Wolves and buffalo, for instance, had no barriers to interbreeding until humans began their widespread killing of them. So, the differences seen historically between then regionally have more to do with climate and food supply than with genetic isolation as seen in fish. These populations represent more of a continuum rather than defined subunits or subspecies. In contrast,even salmon that spawn in the same stream can become reproductively isolated from each other because they spawn and die in different sections and times of the year. Idaho’s Spring and summer runs of Chinook salmon spawn in August and September but occupy different drainages. While there are Fall Chinook which spawn in December lower in the drainage. That being said they are all the same species but are managed differently by the states and under the Endangered Species Act. This is from an old guy in Colorado who has searched pretty much daily for good news and stories about the wolves since reintroduction. You gave me a very large lift with your April 1 post – I’ve thought of it every day since (no definable edge between dreams and fiction). Would it be possible to send a copy to me to read again often? You have my word I won’t share it with others. An article in the local paper, Cody Enterprise, discusses (again) the effort to remove lake trout from Yellowstone Lake. Sounds like a loosing battle, similar to the battle for the cutthroat vs. the rainbow in this story. It seems as though the powers that be wait until the crisis is almost insurmountable before they try to stop it.